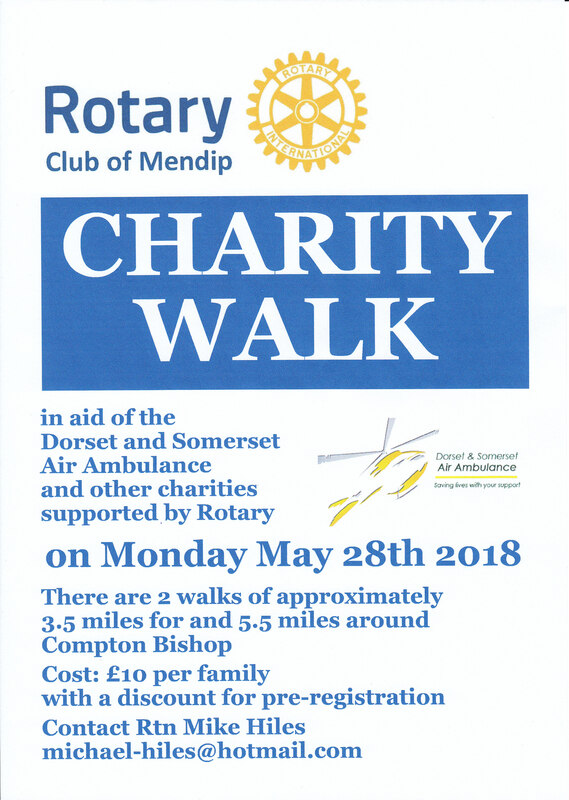 When you have completed the Exmoor Challenge come and join The Rotary Club of Mendip for our charity walk. 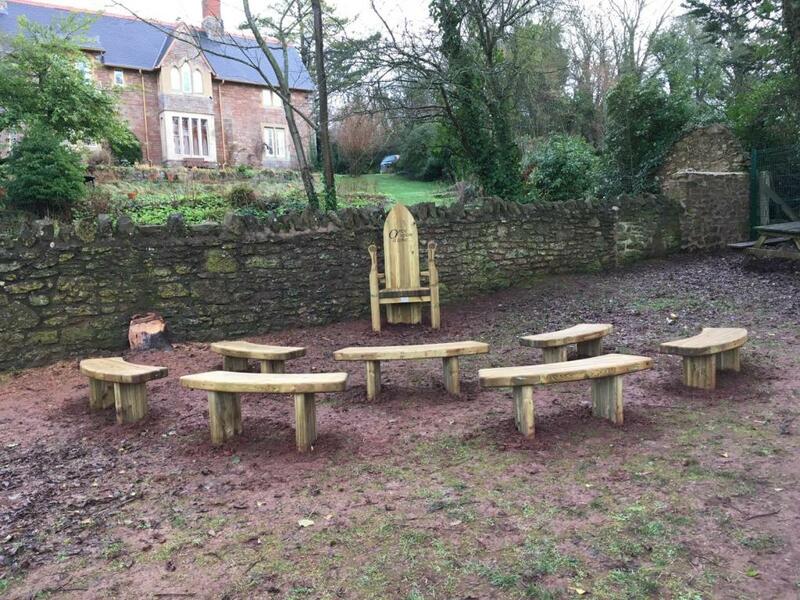 In association with the Draycott & Rodney Stoke First School PTA, the Story Teller Chair was funded by the Rotary Club of Mendip with the benches funded by the PTA. The Chair is the focal point where their teacher can sit while the children gather around on the benches. The teacher can then conduct the class with stories or other learning activities. The idea is that as children like being outside where they are more relaxed and enjoy their time, the equipment will be very useful. Adam Travis the Club President handed over a cheque for the chair. The crocus bulbs planted by the Club in Cheddar are now in bloom for all to see. 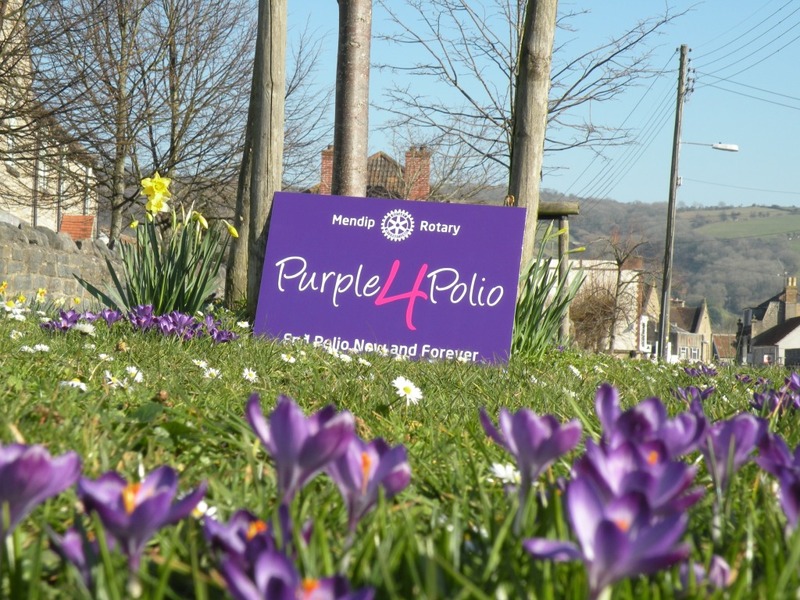 They were planted to remember the aim of Rotary International, to eradicate polio worldwide. Club involvement goes back to the very beginning when Rotarian John Lane was the Rotary International Great Britain and Ireland Treasurer for Polio Plus which was the initial name for the scheme. Polio has been reduced by 99.9% and in 2018 was only found in two countries, Afghanistan and Pakistan. There were only 31 recorded cases. 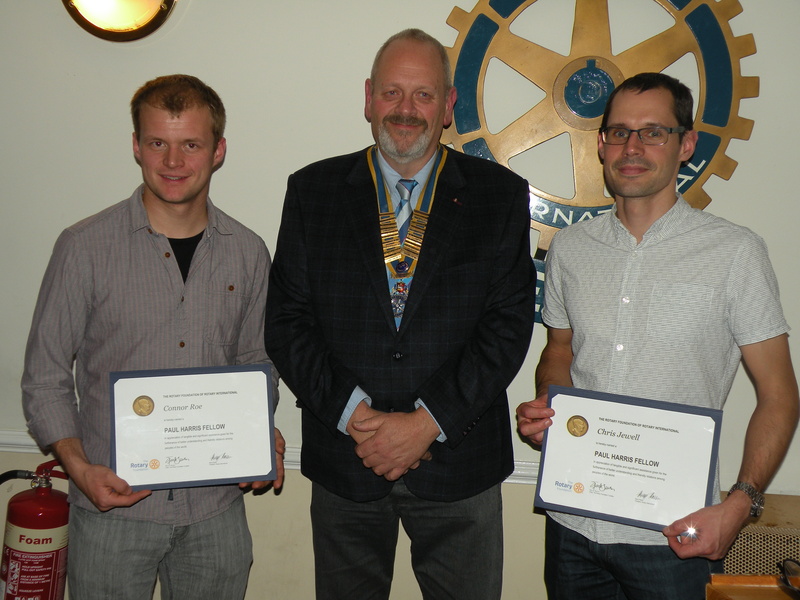 The Rotary Club of Mendip honoured two of the Cave Rescue Divers from the Cheddar Valley who were involved in the rescue operation to free the boys from the Thailand football team who had become trapped in the Tham Luang Caves. Chris Jewell and Connor Roe were part of the International rescue operation and both were involved within the cave system to bring the boys out. Chris and Connor are members of the British Cave rescue Council. At a special Club meeting the two were presented with the Paul Harris Fellowship Award. It was considered that the two had exemplified the essence of Rotary “Service Above Self”. It is the first time in its 75 year year history that the Club has given this award to Non Rotarians. During the evening attended by members and guests including Rotarians from the Rotary Club of London and Rotary Club of Rugby an interesting presentation about the rescue operation was given. Where are we in the fight to end polio? What bold steps are we taking to get there? Find out during a live event on World Polio Day. 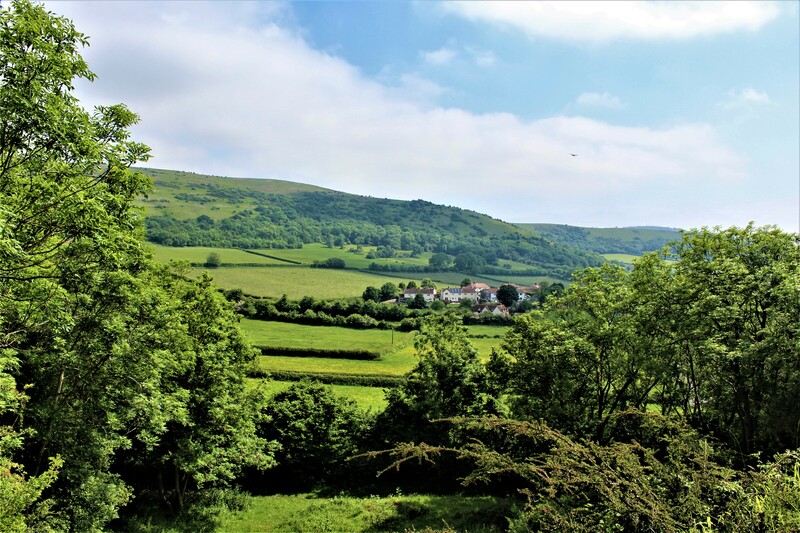 One of the stunning views experienced by those taking part in our Charity Walk. 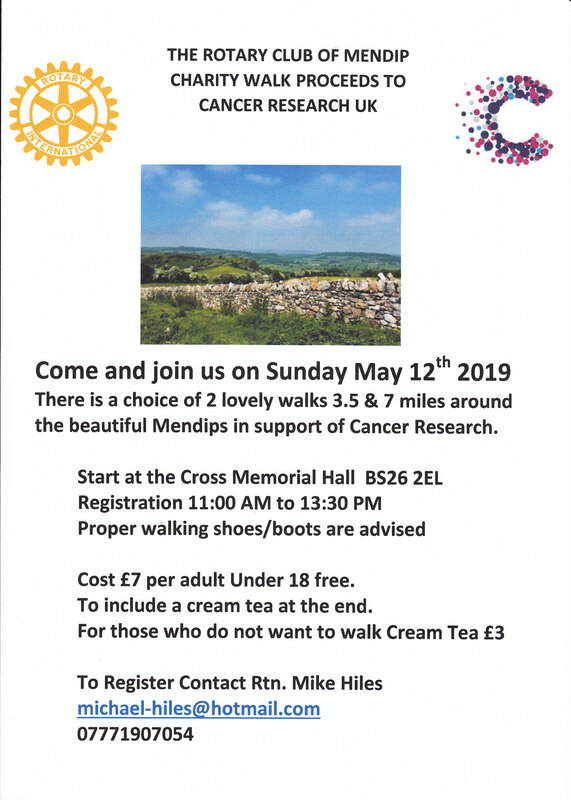 40 people and children took part in the Rotary Club of Mendip inaugural charity walk. This included participants from 5 other Rotary Clubs. Frome RC, Frome Town RC, Frome Selwood RC, Bridgwater RC and Bradley Stoke RC. There were 2 walks one for families of approximately 3.5 miles around Compton Bishop and a longer walk of 5.5 miles to Crook Peak and back. Both walks set of from the Cross Memorial Hall. The walks included a treasure hunt to keep everybody interested. Seven families took part in the event. After the walk there was a presentation of certificates to all walkers and the winners of each walk who had the most correct answers. This was followed by a BBQ where everybody relaxed in the sunshine and recounted their experiences. 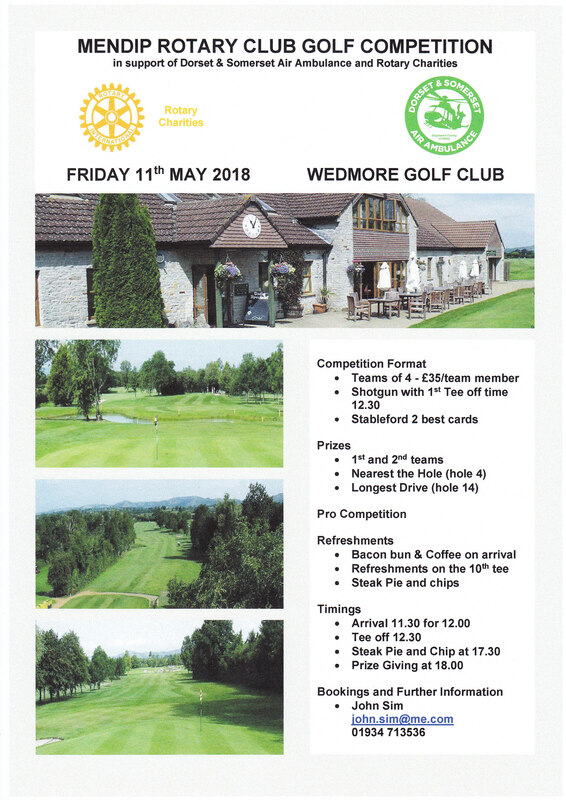 Come and join us on 11th May 2018 and support the Dorset & Somerset Air Ambulance and Rotary Charities. Shotgun start at 12:30 so the teams can all enjoy fellowship with a meal after the round.